First things first: MAJOR SPOILERS follow for Life is Strange. If you haven’t played it, I urge you to, as it’s one of the most genuinely heart- and gut-wrenching games not just of 2015, but of all time. This article is the first instalment in my Life is Strange retrospective series, with more to come in the next few weeks. So, with that, let’s jump into the inaugural topic: chasing the past. As we get older, we tend to look back on the past with rose-coloured glasses, forgetting the bad times and remembering only the good. Nostalgia is a powerful force, so much so that some of us to go great lengths to recapture the joys of our childhood. But no matter how hard we try, it’s never the same. A lifetime of experience makes us different people from who we were back then, desensitised to the wonders that once enraptured our younger selves. It’s hard to pretend action figures are real when playing with them just reminds you of how expensive they are now compared to 20 years ago, and it’s similarly difficult to enjoy a carnival when all you can think about is how many calories there are in a stick of fairy floss and how many movies you could buy for the same price as one ride on the Ferris Wheel. Even catching up with old friends and reminiscing about the good ol’ days only serves to highlight how much things have changed. And yet, impossible as it is, we still try our darndest to subvert the space-time continuum and recapture the innocence of our youth. Life is Strange is built on this eternal struggle. The story begins with Max returning to her quiet home town of Arcadia Bay after spending five years in bustling Seattle. In the first half hour of the first episode, she encounters Chloe, the best friend she essentially abandoned half a decade prior. Her very first interaction with Chloe is saving her life, before she even realises it’s Chloe she’s saving. This marks the beginning of her journey in time travel, both in the literal sense of discovering her ability to manipulate time as well as the figurative sense of reconstructing the relationship that defined her childhood. From that point on, Chloe becomes the centre of Max’s story. Max has to conquer time itself to keep Chloe alive, while simultaneously attempting to restore the bond they had so many years ago. Max and Chloe spend a lot of time wistfully recalling their younger years, when their days were filled with imaginary pirate battles and couch-fort competitions. Even as they slowly rebuild their friendship, it is clear that those days have passed. For every stroll through a postcard forest, there’s a lethal freight train lying just over the horizon. For every chill-out session or midnight swim, there’s an angry step-dad with a chip on his shoulder. And for every Chloe-and-Max super-sleuth team-up, there’s a harsh truth that wedges itself between the duo. The once-inseparable chums are different people now, and thus so must their friendship be different too. The past they remember so fondly is gone, and not even Max’s powers can bring it back. The incorporeal nature of the past is evident in the ghost of Rachel Amber. Echoes of the missing girl’s existence pervade Arcadia Bay, reminding Max that she’s a replacement now, just as Rachel was originally a replacement for her. Tree carvings and junkyard graffiti reinforce the fact that Max is stepping into worn shoes, shoes she literally puts on at one point only to be compared even more unfavourably to the person she’s not. The differences between Max and Rachel highlight how much Chloe and her tastes have changed, and that just becomes more apparent as Max is exposed to drugs, guns, and violent death threats. Joyce - Chloe’s mother - initially believes Max will be a good influence on her daughter, but as Max and Chloe dig deeper into Rachel’s disappearance, she realises that the opposite is true. In trying so hard to make up for her absence, Max allows Chloe to mould her after Rachel’s rebellious image. Instead of reviving the past, Max just ends up distancing herself from her own. Perhaps the most painful example of the futility in focusing on the past comes when Max discovers she can use photos of herself as portals to travel back to specific moments of her life. She inadvertently whisks herself back to the day when William - Chloe’s father - died, and immediately sets about preventing that from happening in the belief that his survival will make Chloe’s life better. Despite successfully averting his death, however, the new future Max creates is far from idyllic. In this timeline, she is a member of the dreaded Vortex Club, as vain and conceited as her arch-enemy-turned-best-friend Victoria. She hasn’t even reunited with Chloe yet, and when she does, it’s one of the most tragic moments of the entire game. Chloe is wheelchair-bound, paralysed from the neck down from a car accident Max’s tampering brought about. Her life is constant pain, so draining on her and her parents that she begs Max to help her end it all. Max is left with no choice but to undo her changes and let William die instead, choosing the devil she knows over the horror she created. Her good intentions were for naught, serving only to inflame old wounds with new regret. 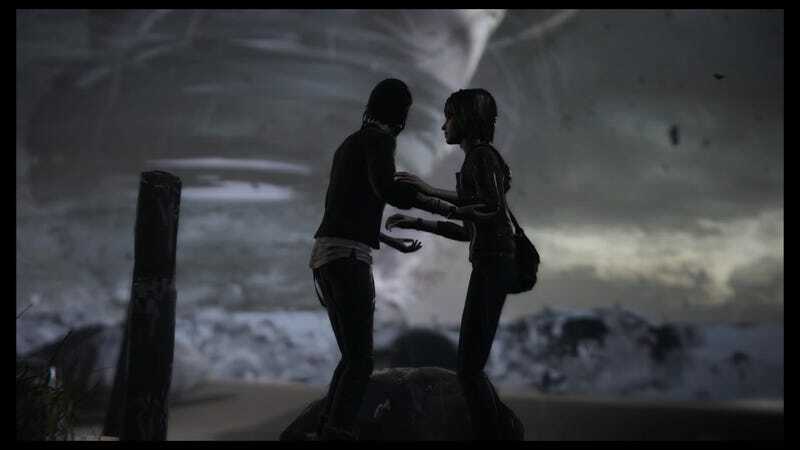 The heavy cost of chasing the past is epitomised by Life Is Strange’s final choice. After sacrificing her reputation, her safety, and her very identity to keep Chloe alive, Max is forced to weigh her best friend’s life against that of the entirety of Arcadia Bay. If she chooses to save Chloe (the past), she dooms Blackwell College, her friends and peers, and Arcadia Bay (her future). If she protects her future, she abandons her past yet again. The past and the future cannot co-exist peaceably; the present can only face in one direction. This is a choice we all must make at some point in our lives. Just as Max must decide whether her personal happiness is worth the suffering of countless others, so must we consider the price of clinging too tightly to what’s come and gone. Nostalgia can make us happy, but if we spend our whole lives looking backwards, we’ll never know the beauty of the world in front of us.